Private Detective For Hire. No Previous Experience. Eugene Blake’s quit his job to become an old-fashioned private eye. He’s got everything he needs: a 1940s raincoat, a detective’s notebook and a little clicky pen. When he meets the mysterious Melissa White she takes his breath away. Tasked with finding her missing husband, Eugene is drawn into the shadowy underworld of London and has to solve the dangerous puzzle of his very first case. Once he’s been chased, punched and shot at, he wonders whether he should have stuck to his day job. If you like your novels hardboiled you will love this funny, thrilling and very British twist on the private detective genre. 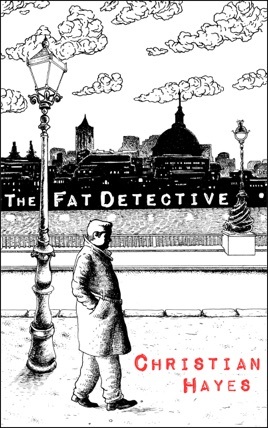 The Fat Detective is the first book in the Eugene Blake trilogy by London novelist Christian Hayes. The story moves along at a nice pace and keeps you interested. It was a good use of free time, highly recommend! Ok premise and tone, but the author can’t keep his character’s names straight. Charlotte is sometime Christina and David is sometimes Eugene. Very confusing. I gave up in chapter Q.